Holy cow! It's only a few days before I'll be in LA again for the #DisneyMoviesEvent for the red carpet screening of Frankenweenie and more. There's no better time than now to share these awesome sweepstakes, activity sheets and a new featurette with you. I'm so excited to be able to see this soon. What would you ask Kyahh! The red carpet event has been shifted to Monday, Sept 24th instead and it'll be a black and white theme. Ha! At least that now helps to narrow down my dress choices. Teehee! Love this new clip and it even shows Tim Burton, Martin Short, Catherine O'Hara, Winona Ryder and many more talented voice actors of this movie. During this event, I will be participating in an interview with Robert Capron (“Bob”), Atticus Shaffer (“Edgar ‘E’ Gore”) and Charlie Tahan (“Victor Frankenstein”). What would you like me to ask them? I, myself, am a bit curious about what it feels like to just do the voice-overs for the roles. How do they get the feel of the scene? You know what I mean? Of course, to go with a cool film is always fun activity sheets. What's a movie without it's mad science experiments? 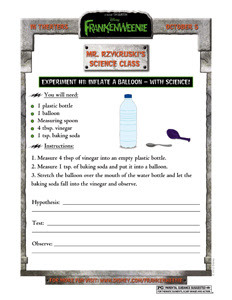 I've coalesced them into one file so all you need to do is click the picture below to download the pdf file for 2 sweet science experiments. 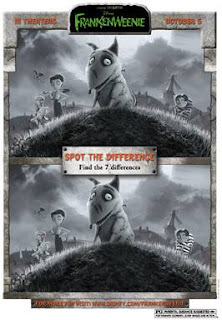 In case you hadn't gotten a chance, here are the Frankenweenie activity sheets I got for you last week. Click the picture to download. They're so fun! Frankenweenie hits theaters Oct 05th. WOW I didn't know Winona Ryder is in this movie! I love here! I would love to know if she plans on doing more movies in the future and if they've ever thought of doing a "Reality Bites" reunion (movie about where those characters ended up). That would be awesome! Fun!! I've always wondered how hard it would be to speak for a character who isn't me! I can't wait to see this movie. It looks like so much fun and my kids are going to love it! Kinda sorta reminds me a little of Beetle juice, maybe because of Winona? My husband and kids are fans of movies like this. It would be fun to watch it around Halloween time, if it's even in our area by then!